The legendary birthplace of Aphrodite, Cyprus is a beautiful land of undulating contours bathed in almost luminous sunshine where glittering Mediterranean waters lap golden shores. Inland, rocky plains give way to hills and ‘kokkinokhoria’, or ‘red villages’, so called because of the red-tinged local soil. Punctuated by windmills, these sleepy towns offer a fascinating glimpse into everyday Cypriot life and stand in real contrast to the effervescent coastal resorts of Protaras and Ayia Napa - the latter of which has earned itself an international reputation for great nightlife and stands shoulder to shoulder with Ibiza as a premier Mediterranean clubbing destination. 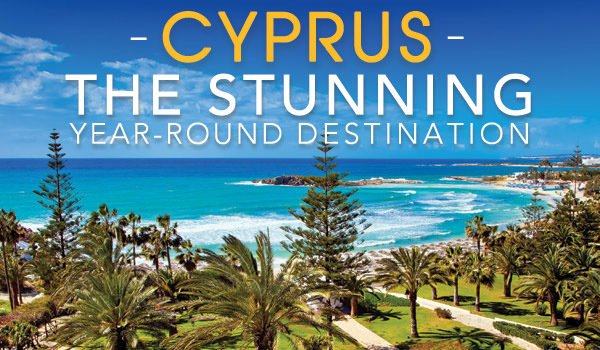 With its stunning beaches, charming resorts and delicious home-cooked food, Cyprus is a real gem of the Mediterranean. Escape to a local taverna where you can try traditional cuisines. From meze dishes serving up grilled halloumi, homemade hummus and delicious wine you’ll have plenty to enjoy. Did you know? As per topcyprustaxi.eu, taxi drivers in Cyprus do not give change. They keep the change as a tip. A quick tip to save money in Cyprus is to tender exact change to the taxi driver. With warm, shallow waters, the beaches of Cyprus are the perfect place for little legs to go paddling; and make sure you keep your eyes peeled for sea turtles! Spend the afternoon cooling off in the waterpark or enjoying ice cream at the harbour. 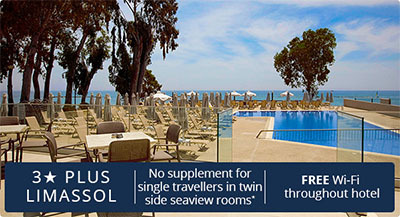 Cyprus holidays are the perfect choice for those who dream of a holiday in the sun. With a history that stretches back over 9,000 years, it's no surprise that no matter where you go, you'll have an abundance of culture and tradition that fuels the imagination and invigorates the mind. At the Corallia Beach Hotel Apartments, you'll have all the benefits of apartment style holiday living and still enjoy hotel style service. 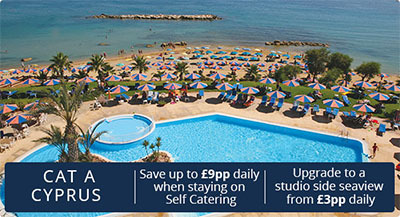 Enjoying a stunning location directly on the beach at Coral Bay, the Corallia Beach Hotel offers apartment accommodation with full hotel services. The hotel is surrounded by colourful gardens including a swimming pool with views overlooking the emerald blue waters and the beach. 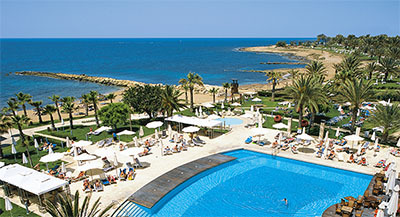 The four-star Leonardo Plaza Cypria Maris is located in the popular area of Paphos in Cyprus. This adults-only resort is located directly on the beach, allowing you to soak up the sun on the golden sands looking out onto the Mediterranean Sea, as well as the exotic gardens that surround the property. A warm and sunny welcome awaits at the Sweet Memories Apartments in Protaras. Friendly and family-run means the personal touches are not forgotten at the bright and airy property which is close to gorgeous sandy beaches. 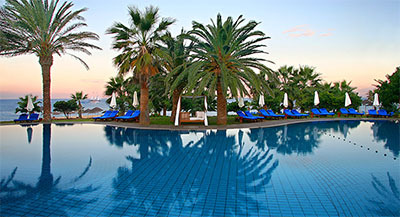 A large swimming pool, with small splash pool for children, is at the centre of a spacious sun terrace with comfy sunbeds and umbrellas. There is also a delightful garden and mini-market that stocks all of your holiday essentials. 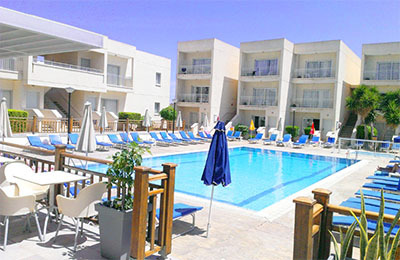 Set just 150 yards from the beach, The Aloe Hotel in Paphos is the perfect holiday base, whether you want to soak up the sun, take in the local history or do a little bit of everything. Combining the wonderfully laid-back quality of a true family-run hotel with the facilities and amenities you'd associate with a big name chain, the Veronica Hotel is quite the surprise. Situated in attractive gardens, and benefitting from an excellent location, close to shops and restaurants, it's a great choice for anyone holidaying in Paphos. 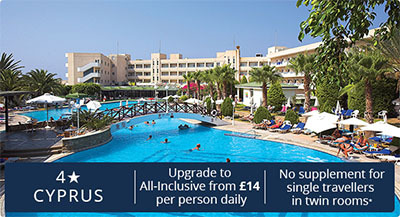 And Paphos is a great choice of resort for anyone holidaying in Cyprus. It's got everything you want from this part of the world – the history, the culture, the sand, the sea and the altogether different pace of life, all wrapped up in one fascinating city. 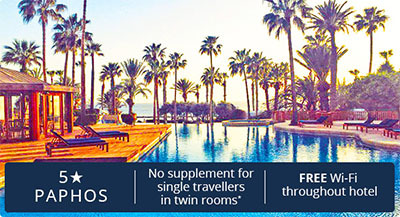 Located in the vibrant town of Limassol, this hotel is close to modern and cosmopolitan buildings which hosts a rich trail of mythical stories, artefacts and beautiful sights. Guests can also indulge in the fantastic shops, delicious restaurants and exciting nightlife that Limassol has to offer. 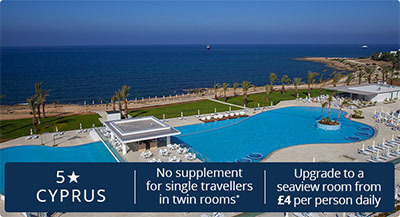 Arguably Cyprus' most famous and prestigious residence, the 5-star luxury Annabelle hotel is a family run oasis set within six acres of tropical gardens on Paphos' Mediterranean seafront. A magical setting is created by meandering pools, waterfalls and palm trees, with stunning views over Paphos' charming fishing harbour. The 5-star Almyra is a sophisticated hotel offering guests luxurious facilities and contemporary accommodation in an unrivalled location. 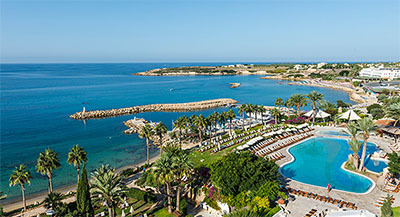 Set on the seafront in eight acres of beautifully landscaped gardens, the hotel enjoys stunning views of Paphos' medieval castle, picturesque fishing harbour and the Mediterranean Sea. Nestled on the edge of beautiful Paphos and right on the edge of the beach, the Louis Ledra Beach Hotel occupies a prime spot. A five-minute drive from the hotel is the harbour side the heart of Paphos. 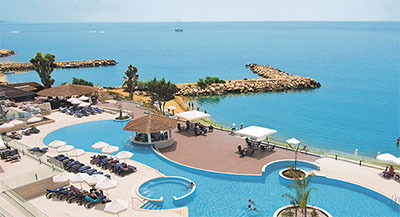 If you're tempted by Limassol's wonderful beaches, its many tourist amenities, or even its vineyards, then The Royal Apollonia (formally the Apollonia Beach Hotel) has got to be high on your list of places to stay. In 2013 this majestic five-star facility underwent a full renovation and additions to the hotels already impressive selection of facilities include the creation of new a la carte restaurant and a fabulous island-shaped outdoor pool. Come to Cyprus and you'll discover a country steeped in ancient history and bathed in golden sunshine. 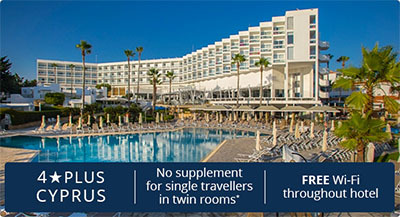 Stay at the luxurious five star Coral Beach Hotel and you'll be able to holiday in the lap of luxury and enjoy the wealth of historical interest to discover in nearby Paphos, which is 10 minutes away by car. The Coral Beach Hotel is situated on a natural sandy beach with its own private boat harbour, on the edge of the wildly picturesque Akamas peninsula, a UNESCO protected area. 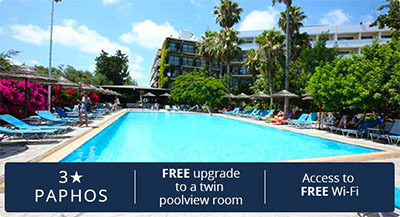 Surrounded by tropical gardens, this award winning, 5-star property is situated upon the beloved Paphos seafront overlooking the inviting Mediterranean ocean. 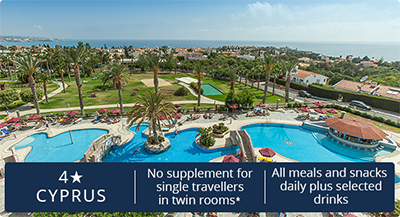 The resort is just 6km from the centre of Paphos and is in close proximity to the finest treasures the island has to offer.